Now that we've used golf training videos one and golf training video two of our RotarySwing.com winter training series to get your setup and your backswing dialed in, video three is all about how to groove your downswing to produce powerful and accurate golf shots. The first concept that you need to remember is to get into a good golf address position with proper axis tilt. Once you're ready to make your golf backswing, we want you to use only your left hand to take your club to the top of your backswing. The goal is to create free and fluid golf swing movements and with two hands on the club, it becomes hard to promote free range movements. Once you get to the top of your backswing, the next exagerated movement which will help engage your legs and core is to actually lift your left leg. By lifiting and stomping your left foot, you can guarantee proper weight transfer and produce power and a quality golf club release. During this golf release drill, make sure you try to practice for a few days with one hand only. As mentioned above, the one handed golf swing will promote a natural movement that concludes with the proper golf swing plane. Only after you have mastered the one handed release drill included in this golf training video, are we going to add in your right hand. Once you feel confident with the "one handed" golf swing drill, you are ready to grasp the club with your second hand, with a very light "fingertip" grip. By adding in the second hand with light grip pressure, your muscle memory will allow you to remain fluid and loose without having your right hand and arm adversely effect your new fluid swing. Remember: Regular practice will result in the best chance of muscle memory and overall golf swing improvement. All right, guys, you should be in a perfect position at the top of the backswing now. We should be loaded up on this right hip. We've made a good turn. We've swung our left arm up to a good position at the top. We're no longer steep and across the line, and all this crazy stuff that the right arm creates. We should be able to get down from that position really easily using some of our transition drills. That's what we're going to focus on now is we're going to get ourselves to shift our weight back to the left, letting the left arm fall, and release while we do a couple other drills to help speed this up and give you a good sense of what it feels like for the club to naturally shallow out in the top of the swing, and get into a good release and impact. Here's what we're going to do now: again, we're revamping what we did, or continuing to build on that. You're going to start from your good set-up position. Please don't ever come to a Rotary Swing golf lesson with no axis tilt. Again, we'll beat you. We're going to get into a good set up position with axis tilt. We're lifting the heel, stomping, and rotating; letting it help swing our arm up to the top. We're in a great position here. Now what I want you to do is I want you to lift your left foot, take a step, and let your left arm fall. That's it. From face on, this will start to make a little bit more sense. Again, set up, good position, take a step, stomp, and let it release the club. The left arm only. This is critical. What I want you to start feeling here when you stop your heel is I want you to hear it. I want you to feel what it feels like to activate the muscles in your hamstrings, your quads, your hips, in order to feel the muscles that you would use to post up at impact. You need to do this before you start bringing the club down. This is critical. This is going to help you understand the transition. We go to the top. From here, I'm going to break this up into chunks. Go to the top, I'm going to stop, make sure my position's still good; if I'm indoors looking at it in the mirror. I'm going to lift, stomp. You'll notice just by doing this little loud little movement stomp, where my hand came down. I didn't try to move my arm here; but just do the little bit of unwinding from my hips and letting gravity start to take over, because I'm getting tired of holding this club up here. As I do that, brings me all the way down, close to a hitting area. What do I need to do here? Let the golf club release. Spend a ton of time, five minutes perfect release video, it's all in there. Just letting my wrist rotate. Notice that I'm not unwinding, ripping my shoulders. I'm not pushing from the right side. I'm not trying to rip my arm down. I'm using my big muscles, my trunk, to bring the club the majority of the way down. Then, my only job is to release it. You get these three pieces of these videos that we've talked about, good set-up, rotate, pivot, shift over here, put your arm up to the top, shift your weight back to the left, release the club. That's everything. If you can do that right, the rest of it's just details. If you've taken the time to get a good set-up and weight shift, and rotation at the beginning ... You've got your arm up to a good position at the top. Now, this is the home run for you. You put all of this stuff together now, all in one piece, and have a great golf swing. You'll notice from down the line, as we do this, I'm going to lift my heel up. Club shallows out perfectly on it's own. That's all you have to do. "You can't do this drill enough," is what I've been telling most of my students. If you're very right arm dominant, which so many of us, ... and unfortunately golf is a lead side dominant sport. As you keep working these drills, the more practice you get swinging with your left arm only, the easier all of this stuff is going to work out for you. Do this drill again 15, 20, 25 minutes a day. Then I'm going to have you stack one piece on it after the first week of doing it left hand only, I want you to start introducing your right hand to it. The trick to this is just putting your fingertips on it, because I want your right hand to come off. If you wrap your paws around it, and you start holding on to it tight, we're going to go right back to our old habits. Fingertip it to the top, take your step, let it come off. Your goal is to not interfere with the club and the natural movements that you're creating here with your right hand. The fact of the matter is, once you put your right hand back on there, because you've probably already been over-using it for so many years, it's pretty well trained. It already knows what to do and typically knows a lot of bad things to do. Just by the fact that you put it on there, you're going to use it more than you realize. At first, just work on fingertips, step, release. Let your right hand come off. As you keep working on this, your goal is to start keeping your right hand on there longer and longer. There I kind of held on at the impact. There I kind of went all the way to the follow-through; but as I did that, I let the club release through. I let my hand really release and almost come off, and pull me around to the follow through. Your right hand is going to do way more than you think it is, so just try and practice not using it. First week drills, left arm only. Don't even let your right hand touch the golf club. Cut it off if you have to. Don't do that for real. Then, week two, fingertips only. Let the hand come off. Later in the week, when you start getting better at it, hold on to it a little bit longer and a little bit longer, until you feel like your swing still feels 100% left hand dominant, body dominant; but your right hand is starting to stay on more like normal a golf swing. This piece, if you can get these three pieces of the swing together, this is the culmination of it. The last thing that you can do, if you want, you can take a medicine ball. This one's kind of heavy, so it's not really ideal for this. You can still use it to get you into the top. You won't be able to hold the ball up there, but the thing that's nice about having a medicine ball like this is it really helps pull you into a follow-through position and pull your arm down into impact instead of you trying to muscle it. With the golf club, you can kind of yank your arm down. With a medicine ball, it's really difficult to do; so you tend to use your body and gravity more to do the majority of the work. If you want a light medicine ball, even a light one, two, three, four pound dumbbell, will also help start training some coordination and some strength in this left arm; which is probably lacking in your swing right now. Again, two weeks, 20, 25 minutes a day. Give it as much as you can. Give yourself a rest day. After these two weeks, at first it's going to feel impossible to swing a club left handed, but I promise you in two weeks, you'll be a pro at it. 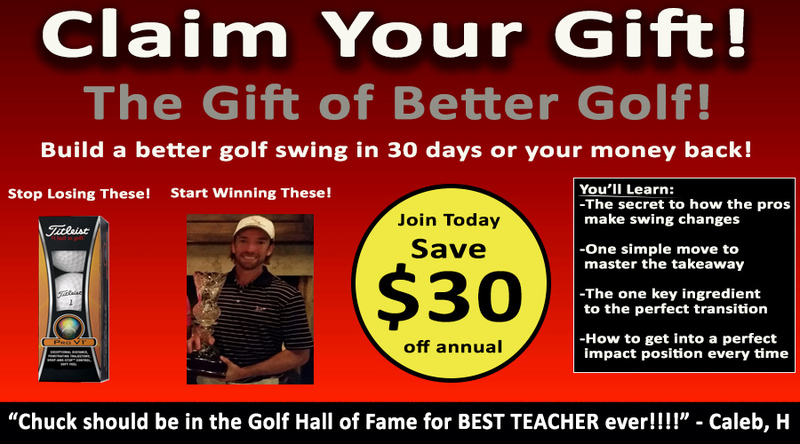 Get Your Free Membership to Finish Watching "Winter Golf Training Program - Downswing" Right Now!